In NASA’s latest interplanetary expedition, the InSight lander will embark on a year-long mission to characterize the interior of Mars. While the surface of the red planet has been scoured from orbit and sampled from rovers, there is still much to learn about the planet’s internal structure. This spring we took a good look at the “how” and the “why” behind the InSight mission in my technical deep dive and spoke with NASA engineer Troy Hudson about the technology and development of InSight’s heat flow probe. InSight launched from Vandenberg Air Force Base in California on May 5, 2018 aboard an Atlas V--the first interplanetary launch from this launch site. 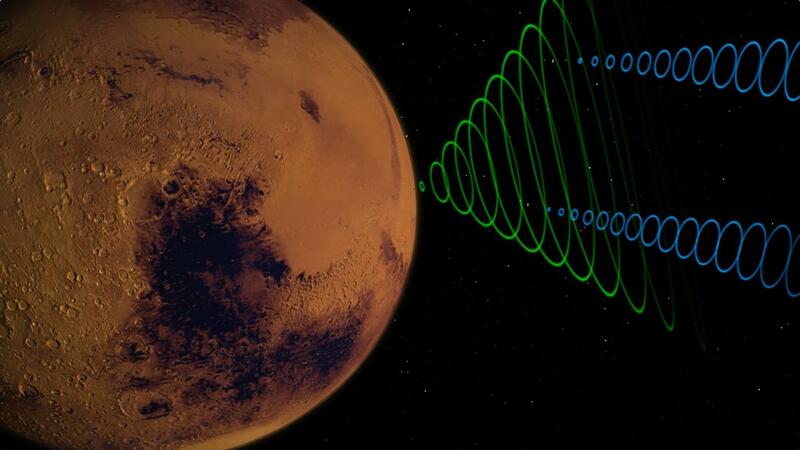 After being set on a trajectory for Mars, InSight and the MarCO CubeSats entered cruise phase until November 22, 2018 when InSight entered Mars’s gravitational sphere of influence 30 minutes behind MarCO-A and MarCO-B. 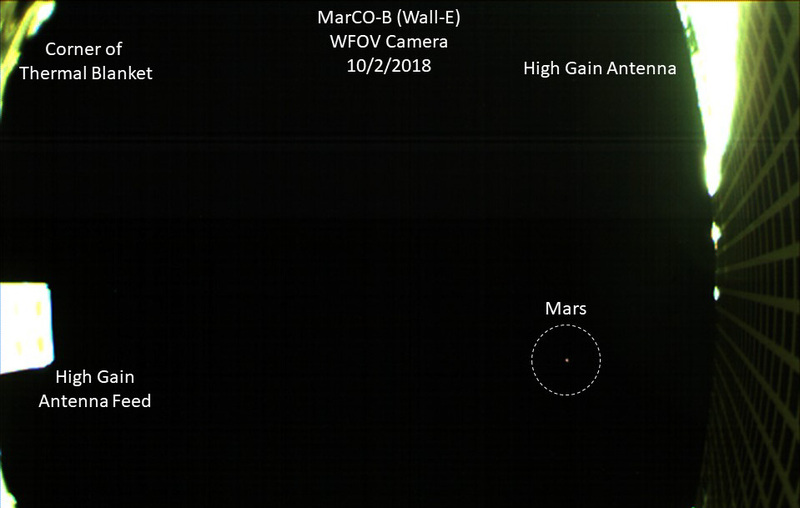 The MarCO CubeSats will perform a flyby past Mars at an altitude of 2000 km while InSight is on target to enter the Martian atmosphere on November 26, 2018. InSight will land in a region called Elysium Planitia. These “heavenly plains” near the equator were chosen precisely because of their lack of interesting features. Unlike mobile rovers sampling rocks or InSight’s sister probe, Phoenix, which searched for water at the poles, the InSight lander doesn’t care much for what’s on the surface. Given the freedom to choose nearly anywhere on the planet to land, the InSight mission team selected a nice, quiet area near the equator, that’s flat and without many large rocks. This makes the job of entry, descent & landing (EDL) as safe as possible and will allow InSight to measure seismic activity and take temperature measurements for its one year mission. Checkout NASA's InSight Press Kit for more details on this mission. Seven minutes before EDL, InSight will separate from its cruise stage. The remaining "entry vehicle" enters the Martian atmosphere at 12,300 miles per hour (5.5 kilometers per second) controlled by small rockets during descent through the thin upper layers. InSight's heat shield will face up to 44 W/sq. cm of heating in this phase. At 7.5 miles above the surface, a large parachute is released, the heat shield is jettisoned, and three shock-absorbing legs extend from the chassis. Just 0.7 miles above the surface and 43 seconds before touchdown, the lander separates from its backshell and parachute. Sixteen seconds before touchdown the lander ignites 12 descent engines and the onboard guidance software slows down the spacecraft to a constant velocity until touchdown. Much of InSight’s EDL systems and chassis designs are inherited from NASA’s Phoenix lander, which searched for water at the poles in 2006. This landing system is lighter than Pathfinder’s airbags or Curiosity’s skycrane, allowing for more of the probe’s total launch mass to go toward its science instruments. 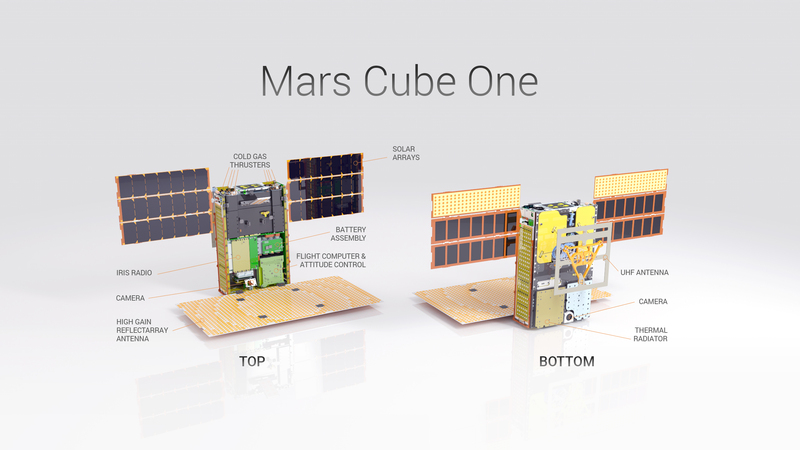 InSight was accompanied on the journey by Mars Cube One, or MarCO-A and MarCO-B, the first two CubeSats to leave Earth orbit. This spring we spoke to Joel Steinkraus about the challenges of interplanetary smallsats and the insight MarCO will provide. Since the CubeSat standard was introduced by Cal Poly San Luis Obispo in 1999, CubeSats have taken the industry by storm. Hundreds of shoebox-sized satellites are launched into low-Earth orbit every year for scientific, commercial, and academic purposes. The environment of Earth orbits is pretty well understood, and is not as harsh on components compared to interplanetary space. The Earth's magnetic field does a pretty good job protecting satellites in lower orbits (and us here on the ground) from harmful solar and cosmic radiation. In deep space between Earth and Mars, the MarCO CubeSats will be exposed to these intense radiation environments. For this technology demonstration mission, Engineers at NASA Jet Propulsion Lab will keep a close eye on telemetry from MarCO-A and MarCO-B, nicknamed Wall-E and Eva, in order to better understand interplanetary CubeSats in the future. Small satellites like these are largely composed of commercial off-the-shelf, or COTS, components. Even in LEO, COTS components can fail and smallsats often can't afford to carry reduntant systems due to size and mass constraints. Since interplanetary space travel isn't all that common (yet), the reliability of these COTS components in deep space is speculative at best. MarCO will characterize the performance of its components and systems over time as the CubeSats make the journey to Mars. MarCO has impressed in more than just tech. The team at JPL developed, built, and tested both CubeSats in 14 months. This Monday, MarCO will also have an exciting role to play in the InSight mission. Each CubeSat is fitted with a new, compact X-band antenna. When the InSight lander enters the EDL phase of its mission it will be on the far side of Mars and unable to directly communicate with Earth. MarCO-A and MarCO-B, however, will be cruising at over 2000 km above the surface. During descent, InSignt will send its telemetry to the MarCO satellites, which will beam the telemetry back to Earth in real time on the Deep Space Network with that new X-band antenna. This part of the mission is a bonus for the MarCO demonstrator, as InSight will contact Earth on its own after landing, but could be a window into how future deep space missions unfold. After InSight has landed and MarCO completes its Mars flyby, it will be mission complete. The CubeSats will carry on, though, and there is still the possibility of an extended mission if NASA can stay in touch with the spacecrafts. NASA will be streaming the events of Entry, Decsent, and Landing with imagery from JPL Mission Control. You can watch that stream right here! If you can't catch the stream. NASA will be posting live updates on their site where you can follow along. Where can I learn more about InSight? We've done extensive coverage of InSight before launch. You can also visit NASA's official site for updates during the mission.